The drive to collect garbage from the Paltan Bazar here by roping in volunteers fizzled out on the first day itself.Mukhya Nagar Adhikari Harak Singh Rawat tied it up with volunteers to pick up garbage from each shop of the Paltan Bazar at Rs 30 per shop per month. The Dehradun Municipal Corporation (DMC) is all set to hold long-awaiting board meeting in the first week of October. The Uttarakhand Assembly was adjourned for a short while today after legislators from Opposition, comprising the Congress and the BSP, sought discussion on various issues under Rule 310. Agitated with the state government for not giving adequate compensation to the people affected by the rains and floods, workers of the Rashtriya Rajeev Gandhi Sena today protested outside the District Magistrate’s (DM) office. They also submitted a memorandum to the DM urging him to take measures for some of the victims of natural calamities. Uttarakhand Chief Minister Ramesh Pokhriyal Nishank thanked Prime Minister Manmohan Singh for releasing Rs 500 crore as interim relief for disaster management in the state. He thanked the Prime Minister on the phone and hoped that the Central government would help the state in these time of crisis. State Congress legislators today staged a walkout over the issue of supplementary demands for disaster management even as the House today approved Rs 1,825 crore supplementary budget for the financial year 2010-11. The Uttarakhand House today condoled the demise of late Uttar Pradesh ministers Pratap Singh and Satyendra Singh Gudia.Remembering former UP minister Pratap Singh, Parliamentary Affairs Minister Prakash Pant said Pratap Singh, alias Pratap Bhhaiya, a resident of Nainital, represented the UP Assembly way back in 1957 and 1968. Yogender Prasad, former Adviser to the Chief Minister and Chairman of Uttarakhand Jal Vidyut Nigam Limited, was found guilty by the Vigilance Commission of favouring Messrs KI Construction company in a Rs 11-crore Joshiara Bairaj project, where the company was supposed to install safety net on the site. The stranded 37 pilgrims of the last batch of the Kailash Mansarovar Yatra will be airlifted tomorrow from Gunji camp to the Dharchula Army base helipad by Air Force helicopters. Ayurvedic and unani doctors of the state have decided to donate one-day salary to the Chief Minister’s Calamity Relief Fund.Dr Ashutosh Pant, regional president of State Ayurvedic Evam Unani Chikitsa Seva Sangh, said the doctors had unilaterally decided to forgo one-day salary for flood-affected people of the state. Lambasting the state government led by Dr Ramesh Pokhriyal Nishank for its inefficient handling of the situation emerging from the recent disaster caused by the rains, Congress President Yash Pal Arya has charged that the government has miserably failed to provide succour to people who continue to suffer on account of apathy. The government is also drawing flak from the people across the region whose grievances are not being addressed. Mona, a resident of Patel Nagar, has been visiting the E-Sampark and the Information Centre located on the Collectorate premises for the past two months to get the domicile certificate of her daughter, but failed to get so. Every time she has been told that the certificate is not signed. Raising their demands once again, Accredited Social Health Activists (ASHA) under the aegis of the Uttarakhand Asha Swasthya Karyakarti Union held a protest and sit-in outside the Vidhan Sabha in support of their long-pending demands. Vegetable vendors, who have been removed from Dharampur to Race Course, staged a dharna here today.They protested against their relocation.The residents of Race Course, too, are not happy with these vendors operating in their posh locality. Work at the Uttarakhand Police Training Academy being built at Narendernagar in Tehri, which was expected finish by September, has once again got delayed.Uttarakhand state will have to wait till the year-end to see its state-of-the-art police training academy ready. The polling to elect new office-bearers of the Gurdwara Shri Guru Singh Sabha, Dehradun, will be held on September 26.Rajender Singh Rajen, president of the sabha, while addressing a gathering at the gurdwara, said today the polling would be conducted on September 26 on the premises of the Gurdwara Shri Guru Singh Sabha, Arhat Bazar, between 11 am and 12 noon. Officials in the District Civil Food and Supplies Department are nowadays working under a leaking roof.Many proposals for its repair have been sent to the Food and Supplies Minister and the district administration. The administration seems to be waiting for some major mishap to take place that will force them to take some steps in this regard. The drive to collect garbage from the Paltan Bazar here by roping in volunteers fizzled out on the first day itself.Mukhya Nagar Adhikari Harak Singh Rawat tied it up with volunteers to pick up garbage from each shop of the Paltan Bazar at Rs 30 per shop per month. The shopkeepers, too, had agreed to pay for the services. As the drive was to begin today, the drivers of the vehicles to be used for the dumping of the garbage, remained missing. A fuming Rawat felt apologetic before the volunteers and assured them of beginning the drive today itself in the afternoon. “I no longer want to break any news to the media unless it actually starts. Most of the time, I have to cut a sorry figure before them when the scheduled drive does not begin on time. The drivers are missing despite the forewarning that they had to be at Paltan at 10 in the morning, but at 12 noon I am hearing that none reached there. I have given them a good piece of my mind to be at the site at exact 10 am from tomorrow onwards. Though even today, they will have to come to do at least a little bit to save the honour of the Dehradun Municipal Corporation (DMC) before the shopkeepers and media,” said Rawat. Today’s incident reminded one of the same occurrence when Rawat had to launch an anti-encroachment drive against rehri-pullers and squatters a month ago. The police force, which the DMC had specially asked to carry this drive on everyday basis, was present on the launching day, but the corporation team, which was to lead the drive, was not available. That day the programme had to be deferred for two days. Rawat had apologised to the Inspector of the police team. The Dehradun Municipal Corporation (DMC) is all set to hold long-awaiting board meeting in the first week of October. After having wrapped up 48 cases of self-assessment house tax, 30 cases of registration of property and a budget costing Rs 104 crore in a meeting of working committee members, the corporation is updating all file work for the next board meeting. Mayor Vinod Chamoli, who got caught in verbal duel with councillor Babita Sehrotra on the issue of favouring hotel owners for giving them extra time in the matter of house tax, was seen adopting a defensive mode by saying that, “The hotel owners are financially sound lobby. If I do not accommodate their concern with leniency, they may approach court and stall all attempts of the DMC to extract house tax from them. Most of the cases of confrontation end up like this, which is why I gave them more time. But unfortunately, I was misunderstood”. The Mayor also said he would dispose of commercial cases of self-assessment tax rapidly as the house taxes were still embroiled in controversies. About the board meeting, he said his priority would be to bring a consensus on the issues of self-assessment house tax and hoarding policy. The revenue matter too would top the chart, he added. As zero hour started, MLAs from the BSP and the Congress rushed to the well of the House seeking discussion over various issues such as the cancellation of minor hydro projects, disaster-linked compensation and other matters. Congress MLAs Kishore Upadhayaya and Amrita Rawat sought a discussion over the issue of recent cancellation of 56 minor hydro projects that were earlier allotted to private parties by the state government. Seeking a discussion under Rule 310, they alleged a big scam over the entire affair. Similarly another Congress MLA Tilak Raj Behad accused the state government of benefiting a private company in Bageshwar for serving its vested interests and sought a discussion over the issue under Rule 310. Another BSP MLA Kazi Nizammudin raised the issue of disaster compensation alleging that despite hike of compensation announced by the government, old rates of compensation were being followed during distribution. BSP’s Narayan Pal also sought a discussion on a separate issue. Dismissing their concerns, Speaker Harbans Kapoor said those issues could not be taken up for discussion under Rule 310 as while some of these issues were not of urgent importance, a few were also sub judice. Both Congress and BSP MLAs were, however, adamant on seeking a discussion on their respective issues leading to pandemonium. The BSP MLAs even sat on a dharna inside the well of the House and the Speaker ultimately adjourned the House for 20 minutes starting 12.40 pm. Congress MLAs also raised a few of slogans against the state government. While briefing the media outside the office, Sushil Rathi, state president of the party, said the administration should make some policy to help out the sufferers or else they would take to streets. Rathi claimed when disaster management officials were told about the damage they just provided Rs 1,500 compensation without checking the loss. “How would this little amount help those whose house has been destroyed completely. Not even a single door can be bought with such an amount,” he mentioned. Rathi said the state government was not able to review the exact loss suffered by people and the politics was coming in the way of releasing the financial help. He said if the Chief Minister was not able to work upon such a crisis, he, along with his other ministers, should resign immediately. According to the Chief Minister, the Prime Minister assured him of sending an expert team to assess the damage caused by the rains and floods. Nishank said the state had suffered much following the rains and floods and the damaged was being assessed. He hoped that the Central government would look into the demands of the state for Rs 21,000 crore compensation. In the post-recess session of the Assembly today, the Congress legislators’ en-course of discussion linked to the supplementary demands alleged that while the state government was in much hue and cry over monetary relief of disaster-affected victims of the state, the government itself had kept a provision of supplementary demand to the tune of Rs 25 crore. The Congress questioned the state government genuine intentions over the tackling disaster management. The supplementary budget is approved for as many as 28 departments prominently include Rs 87 crore for Revenue and General Administration, Rs 66 crore for Tax and Planning and Rs 24 crore for the Excise Department. He said Pratap had an important role in the setting up of Sainik School in Nainital, thus immensely contributing in enhancing education levels in the region. Leader of the Opposition Harak Singh Rawat, too, recalled Pratap’s contribution to education. He said people of the state had confidence in him due to his commitment for the betterment of the society. UKD leader Diwakar Bhatt described Pratap as a man of simplicity. He recalled his role in the university agitation and also the state movement. BJP MLA Govind Singh Bisht and Karak Singh Bora, sitting Nainital MLA, too offered their obituaries to Pratap. Similarly, the House also expressed condolences over the demise of Satyendra Singh Gudia. Pant, Rawat, Bhatt and BSP MLA Mohd Sahajad paid tributes to Gudia. The speakers lauded Gudia’s contribution to the industrialisation in Udham Singh Nagar district. The National Hydel Construction Company, which was given the project, handed the task to its sub-company, Messrs KI Construction. A legal case has been filed against Prasad under the Prevention of Corruption Act under Sections 120-B/409/406, IPC 13 (C), (D) and 13 (2). Superintendent of Police, Vigilance, BK Juyal said the inquiry in the matter was given to them on July 30 in which it was found that Prasad gave the contract of the above-said project without inviting tenders and also gave instructions to the officials of his department to hand over the project to the company. About 93 per cent of the total payment was paid to the Messrs KI Construction Company. “The two helicopters provided by the disaster wing of the Air Force will land at Dharchula by evening today,” said NS Negi, District Magistrate, Pitthoragarh. According to KMVN officers, the pilgrims will be taken by local Jeeps from Dharchula to Tanakpur as only the Pitthoragarh-Tanakpur highway is open to vehicles. “Our vehicles that are stranded at Almora and Nainital cannot reach Dharchula as the motor road linking Dharchula and Almora is blocked,” said KMVN Tourist Officers. According to Almora District Magistrate, one Air Force helicopter took one sortie from Pantnagar to Almora today and lifted three quintals of essential goods for locals. “We need more sorties as essential commodities in Almora are running short,” said Suvardhan, District Magistrate, Almora. Meanwhile, the Industries Association of Uttarakhand too has offered to assist the state in flood relief operation. “We are with the people of the state in their hour of crisis and have offered the government cooperation, especially when a majority of the infrastructure of the state has been disrupted and people have been uprooted from their homes,” said Pankaj Gupta, president of the association. Arya did an on-the-spot analysis in the Kaushyakutauli area of Nainital district today covering an area of more than 20 km on foot. Talking to The Tribune from a devastated stretch on the Bareilly-Almora National Highway, he said: “There are no less than 500 trucks stranded here with their drivers and cleaners not being provided any relief till now. I have also come across six trucks and a car buried in debris. The government must address the concerns of the people here as well as in other areas at the earliest”. He also hit out at Nishank for his politics regarding the demands for financial assistance from the Centre. “Within three days the demand for financial assistance went up from Rs 500 crore to Rs 21,000 crore. “Can the government tell us what survey or analysis forms the basis of the demand increasing more than threefold in such a short time. Even when he had raised the demand for Rs 500 crore, state officials had failed to come up with proposals that did not exceed one-fifth of the said amount. The Centre has assured and is willing to provide all possible help following an aerial survey of the region by Congress President Sonia Gandhi. It is for the state government to come up with rational surveys and analysis,” said Arya. He also attacked the Nishank government for making only a minuscule provision for combating disasters in the supplementary budget. “If they want a heavy assistance from the Centre they must realise that they too have to contribute 25 per cent in the same. Do they have the will for that?” he questioned. Arya has also attacked the state government for its failure to prevent the washing away of more than 7,000 acres of fertile agricultural land in the Terai belt of the region by not taking any preventive and timely steps. He also expressed doubts over optimum utility of Rs 500 crore being provided by the Centre to the Uttarakhand government for relief and restoration. Besides the attacks coming from Arya, the people too have started hitting out at the government. In Haldwani, women from the Subhash Nagar locality went on to gherao the Executive Engineer of the Jal Sansthan for his failure to provide a regular supply of potable water in the area. In Rudrapur, a large number of villagers from the Sitarganj area agitated outside the collectorate seeking that pitching works be undertaken to prevent future damage by the Kailash river. A similar agitation was carried out by residents of villages around Kitcha who wanted an immediate replacement of a transformer that was burnt 10 days ago. They were agitated over the reluctance of the administration to act promptly to provide relief to the villagers who had been living in the dark for several days. A large number of residents of the remote areas of Bageshwar and Almora have also been expressing their anger over the failure of the government to restore supply of essential commodities to these areas. She is not only the one who is facing the problem, there are many others too who are passing through the same phase. Most of the time they are given the date to collect their certificate but some how it is postponed. Mona said she had applied for the domicile certificate of her daughter two months ago and every time the staff sent her back saying that it had not been signed. “They said some signatures were missing on my application form, and if it was such a case, they should have informed me while accepting it,” she lamented. “After two months now, they came to know that the initials are missing. They say that I again need to get my daughter, along with my husband, to tehsil to get the signatures verified. This is really very bad; when the person is sitting to check the form, why are they creating the trouble now?” Asked Mona. Ditto for Haridat Sharma, who visited the centre with his two nephews to get their permanent residence certificate, came back empty handed. “This is the third time that I am going back. They called me on September 1, then on 17 and asked to come after three-four days and now again today I am returning without certificates. The reason they gave me is that the certificates have not been signed and will take some more days”. It can be seen that people need to wait for long to get the certificate, but according to the rules it has to be provided within 15 days. The centre issues all certificates related to caste, resident proof, income, valuation certificate and character certificate. Not only this, delivery counter has to be opened till 5 pm, but the staff does not distribute the certificate after 1.30 pm. Most of the unemployed youth are visiting the centre to get the certificate so that they can apply for the jobs. Sources claimed that more than 150 applications were receiving every day. Earlier, the middleman used to bribe the money to the staff and got the work done immediately, but now the process had been slowed down as people tried to get the work done by them. After inspecting the same, the former District Magistrate has passed the orders to open new counters, but it has been almost more than two months none of the counter had been added. Even it was said a shed would be constructed so that people could wait patiently for their turns during hot days or rainy season, but just two or three tin sheets had been put on it. It was also decided that a separate generator would be provided in the centre but every decision seemed to just lying in the files. 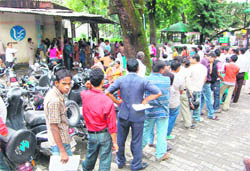 Recently, Lakshman Chowk MLA Dinesh Agrawal had staged a dharna outside the Collectorate Office with his supporters and submitted a memorandum to the District Magistrate addressed to the Governor stating that people belonging to the Scheduled Castes, Backward Classes and poorer sections of the society were being denied of domicile certificate by the administration. To get away from the issue, District Magistrate Sachin Kurve has the reason that the entire state is reeling under natural disasters occurred due to the heavy rain which is delaying the process. “All officials are busy helping the people who have become victims of the disaster, thus files that are to be signed are kept pending for the time being,” he affirmed. 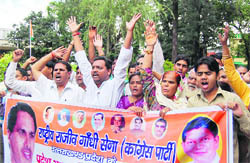 Led by union president Shiva Dubey, the members raised slogans in support of their demands that include making the National Rural Health Mission Programme permanent, regularising ASHA workers, regularising allowances, making cheque-based payments, increasing honorarium from Rs 850 to Rs 900 and providing restroom facilities for ASHA workers at PHCs and hospitals. They asked the government to end exploitation of the ASHA workers. “The government has refused to pay heed to our demands, though ASHA workers are carrying out a majority of services in rural and remote areas of the state,” said Dubey. Later, they submitted a memorandum addressed to the Health Minister. Mayor Vinod Chamoli said he could not allow them to return to Dharampur. “These vendors occupied the area near the road in Dharampur illegally and brazenly despite several reminders from the Dehradun Municipal Corporation (DMC). Later, they were shifted to the Nehru Colony. But it was found that many of them did not move and had their relatives or other family members occupying the same place. These remaining ones were later shifted to the Race Course, from where many of them returned once again. A long time lapsed in between, but we managed to send them again to the Race Course. But now strangely people at Race Course too have begun opposing the vegetable market in the area. It has become a headache for us”. Vimla Gupta, a resident of Race Course, said ever since the vegetable market had shifted to Race Course, the surrounding areas had become dirty due to the stale leftovers, which kept piling up for days, as no one took charge of disposing the accumulated garbage. The problem became serious on rainy days. The vendors too do not seem happy either. Rashpal Kumar, a vendor, said first they were not ready to come to this place as they had customers in Dharampur, and now it was the residents who were creating trouble for them by quarrelling on one thing or another. Chamoli said this time around, he would talk to both vendors and residents separately to seek out a permanent solution of his problem. Police sources said earlier the academy was expected to be ready by July. The deadline got extended to September. Now, the authorities estimate the work to finish by the year-end. Police officers blamed incessant rain, which has lashed the whole of Uttarakhand, for the stalling of work over the past two months. However, they had no answer to why the construction did not end by July. Speaking to The Tribune, GN Goswami, Superintendent of Police (Training and Personnel), said, “The academy will have been ready by September, but heavy downpour adversely affected the construction work. The work was stalled for the past two months as the only road leading to the academy was damaged”. “Almost all work is complete. Only things like basic amenities are to be put in place,” Goswami said. Police personnel from the rank of sub-inspector and above will be trained at the police academy. Besides this, refresher courses, special commando training and IPS probationary training will also be held in the state, the SP said. Once the academy is ready, the state will save crores being spent as capitation fee in other states, including Punjab and Uttar Pradesh, for training its police personnel. High-placed police sources said that the Uttarakhand police has spent about Rs 9-10 crore on training in other states. This state-of-the-art training academy is being built with a budget of about Rs 12.5 crore. The academy will have facilities like a big auditorium, multi-speciality hall, administration block, quarters for police employees, barrack facility for at least 100 trainees, horse-riding fields and small forensic lab. It will also house the Uttarakhand police’s biggest parade ground. Rajen also made an appeal to the members of the gurdwara, toparticipate in the election procedure and help the association in constituting a new batch of the office-bearers the Gurdwara Shri Guru Singh Sabha. Sources affirmed that the 70-year-old building needed to be renovated and around Rs 7.5 lakh would be needed, the estimate of which had been sent many times to the department concerned. Around 50 officials are working in the building which houses various sections like the ration card area, petroleum office, shop distribution department, food and supply office and weight measurement office. A official, on the condition of anonymity, said as they were dealing with documentation, they were constantly worried about official papers getting ruined after getting wet. “Sometimes, the situation is such that we use an umbrella while working,” he said. Mahender Singh Bisan, District Civil and Supply Officer, said, “We have sent the proposal thrice to the directorate and the District Magistrate but nothing has been done till now. They have again asked us to send the budget proposal and we will send it soon”. Sources claimed that the building had neither been repaired since 1973 nor had it been painted ever. Not only this, the Tehsildar also has his office in the same building. His Administrative Officer Atar Singh said whenever rain occurred, water started dripping from the roof and seepage could been seen on the walls.